Bennetts Senior Classic TT winner John McGuinness (centre) with runner-up Jamie Coward (right) and Lee Johnston, who finished third. John McGuinness made a winning comeback from injury as he dominated the Bennetts Senior Classic TT on the Isle of Man. 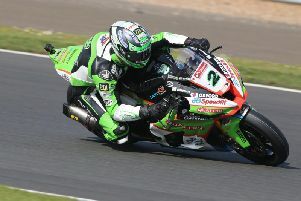 McGuinness, who hadn’t raced competitively on the roads since he suffered injuries including a badly broke right leg in a crash in practice at the North West 200 in 2017, won by 1m 13.072s on the 500 Winfield Paton after four laps. John McGuinness won the Bennetts Senior Classic TT for the second time on the Winfield Paton 500. Jamie Coward on the Ted Woof/Craven Manx Norton finished in second place with Fermanagh’s Lee Johnston completing the top three on the Davies Motorsport 500 Honda. Clearly emotional afterwards, McGuinness said: “I never ever thought I’d be able to pull back into this winner’s enclosure here, but I’ve worked really hard and it feels very special. McGuinness – who also won the Senior race in 2016 – had led the times in practice and the Morecambe man, who set off from number one, was never headed as he moved into a lead of almost nine seconds at Glen Helen over Maria Costello (Beugger Paton), with Alan Oversby (Davies Motorsport 500 Honda) 1.3s further back in third ahead of ahead of Coward. Welshman Ian Lougher was an early retirement on John Chapman’s MV Agusta at Union Mills as his back luck in the race continued. At Ramsey hairpin, McGuinness’s lead was up to 24.8s over Coward, who had moved up to second place by 4.4s from Costello. Chris Swallow (Linsdell Enfield) was fourth in front of Johnston, while Oversby was reported as a retirement. An opening lap of 110.501mph by McGuinness put him firmly in control and the 23-time Isle of Man TT winner now had an advantage of 38.3s over Coward, who was only 1.8s clear of Costello in third. McGuinness increased his cushion to 1m 11.1s over Coward at the end of lap two, although Costello had now run into problems with her Paton as she slipped back to fourth position behind Johnston, who was on the move after a lap of 108.189mph. Race leader McGuinness made his pit stop at the end of the third lap, pulling in for fuel with a gap of 1m 32.8s over Johnston, who had now picked up another place as he moved into second ahead of Coward. However, Yorkshireman Coward was able to complete the full race distance without making a pit stop on the Norton and he regained second position at Glen Helen on the fourth and final lap, trailing McGuinness by 47.9s. Johnston was now fourth on corrected time after his pit stop, with Swallow climbing to third on the Enfield. McGuinness nursed the Paton home for a popular victory and the 46-year-old crossed the line to win by well over a minute from Coward, while Johnston snatched the final podium spot from Swallow on the last lap, taking the flag 25.5s behind runner-up Coward. Michael Russell on the Izzard Racing Norton and Danny Webb (Dunnell Racing Norton) completed the top six, followed by James Hillier (CSC Racing Honda) and Chris McGahan (500 Honda). Mick Moreton came off his Paton at Handley's but was unhurt on the opening lap of the race.